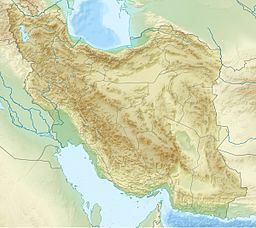 Mount Tochal, located to the north of Tehran. Tochal (Persian: توچال‎ Točāl) is a mountain and ski resort located on the Alborz mountain range, adjacent to the metropolitan area of Tehran in northern Iran. It includes a 12-kilometre-long (7.5 mi) ridge. Its highest peak, also called Tochal, is at an elevation of 3,964 metres (13,005 ft). Lavarak (3,560 m [11,680 ft]): accessible by main Tochal ridge or Imamzade Davood climbing path. Bazarak (3,753 m [12,313 ft]): accessible by main Tochal ridge or Imamzade Davood climbing path. Palang-chal (3,520 m [11,550 ft]): accessible from Darakeh valley and Palangchal Shelter. Sar-Bazarak (3,640 m [11,940 ft]): accessible from Palangchal peak and main Tochal ridge. Shah-Neshin (3,875 m [12,713 ft]): accessible from Tochal main ridge, Hezarcham path and south (Abshar-Dogholoo) ridge. Tochal (3,964 m [13,005 ft]): The highest peak of the range, accessible by any climbing path that ends on the Tochal main ridge. The usual path from Tehran is by the south ridge (normally from Shirpala shelter and Siahsang hut). Spilit (3,120 m [10,240 ft]): through Band-yakh-chal and Shervin hut by rock climbing or Klakchal ridge. West Lezon (3,585 m [11,762 ft]): accessible from Tochal main ridge, Kolakchal shelter or Shirpala shelter. East Lezon or Piaz-chal (3,540 m [11,610 ft]): accessible from Tochal main ridge, Kolakchal shelter or Shirpala shelter. Siah-band (3,320 m [10,890 ft]): from Dar-abad valley and Dar-abad hut. A 360° View from Tochal peak. Visible are the two shelters on the peak, as well as Mount Damavand on the horizon, as well as Tehran. Station 1 is at an elevation of 1,900 m (6,200 ft) and located at the beginning of Velenjak valley (end of Velenjak Street). Parking, inns and some other facilities are available. Station 2 is at 2,400 m (7,900 ft) and has very limited facilities. Station 5 is at 2,935 m (9,629 ft). There is a restaurant and a rescue center. This station is in the middle of one of the ski slopes which is open only in mid winter. This station is also accessible through several climbing paths like Shirpala shelter, Osoon valley and Palang-chal shelter. Station 7 is at 3,740 m (12,270 ft) and very close to the Tochal main ridge. It is the last station of the gondola lift. This station is in the middle of the Tochal ski slope. The Tochal main peak is 30 minutes walk from this point. This station is also reachable from Hezar-cham climbing path from Station 5. Tochal Peak at 3,964 m (13,005 ft). A scene in the vicinity of Shir-pala, Tochal. Darband Twin Falls, near Shir-pala, in Tochal main route. Wikimedia Commons has media related to Tochal. This page was last edited on 17 March 2019, at 23:19 (UTC).